The brainstorming wasn't going well. My mother-in-law's birthday was on the horizon, so I asked Mr Finchley Kitchen for cake ideas. "Old people? 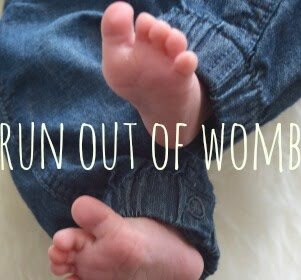 ", he suggested, since MIL volunteers with the elderly. I couldn't think that a geriatric-themed cake would be very cheerful. And as for his next suggestion - Arsenal, for his mum is a season-ticket holder, I thought a Gunners t-shirt might be a bit too five-year-old. Luckily, it was sister-in-laws to the rescue: they reminded me that their mum loves the beach. 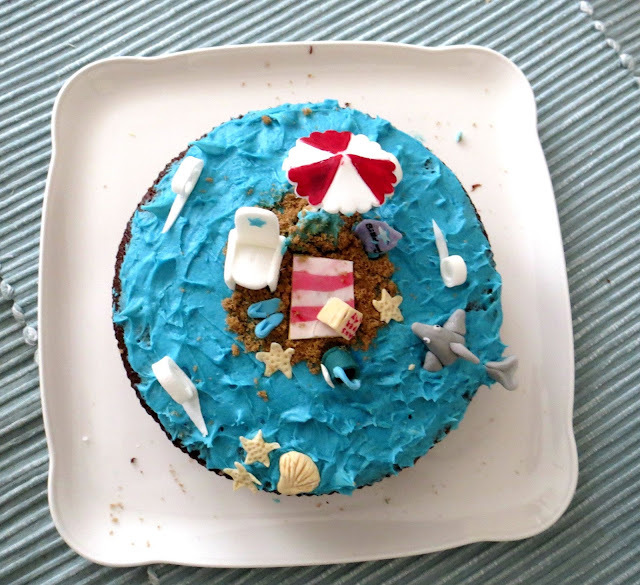 So beach cake it was. Birthdays are a chance to bake a cake that is too time-consuming for everyday occasions, like the fact that it's been raining all day, which I fairly regularly regard as a great reason to get the scales out. But as with the house cake, here I made the fondant bits in advance and baked the cake on the actual day, to ensure it was fresh and the decorations were solid. 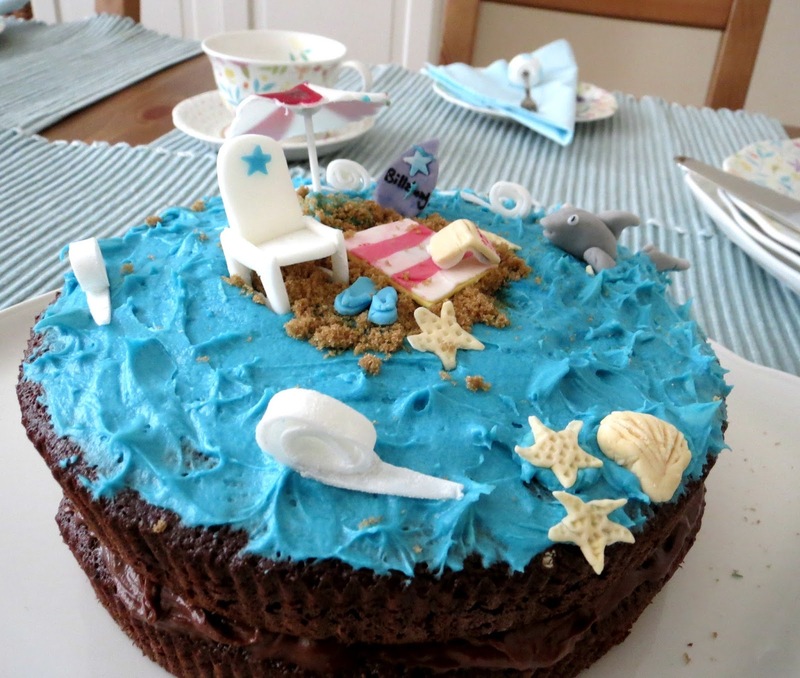 So for the toppers: I went for hand-formed flip flops, and shells, (little stars prodded with a fork for star-fish shapes), rolled out red and white stripes of fondant to create a beach towel, and then spent ages trying to get a free-standing parasol. 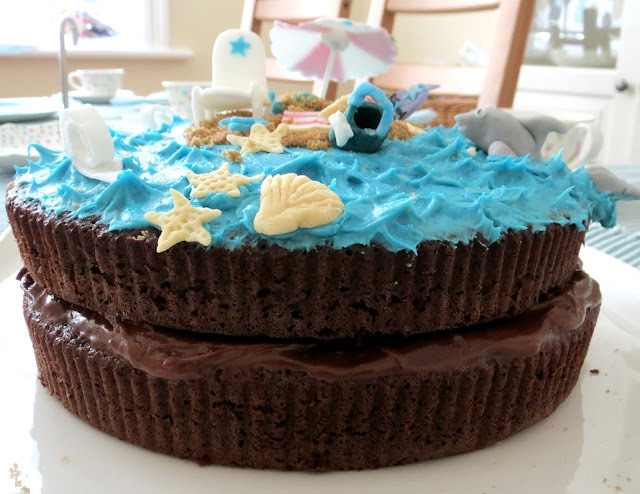 I eventually made it by cutting out a circle with a ridged cookie cutter, painting panels with gel icing, then letting the parasol set on a table tennis ball (the exact right shape, it turned out!). 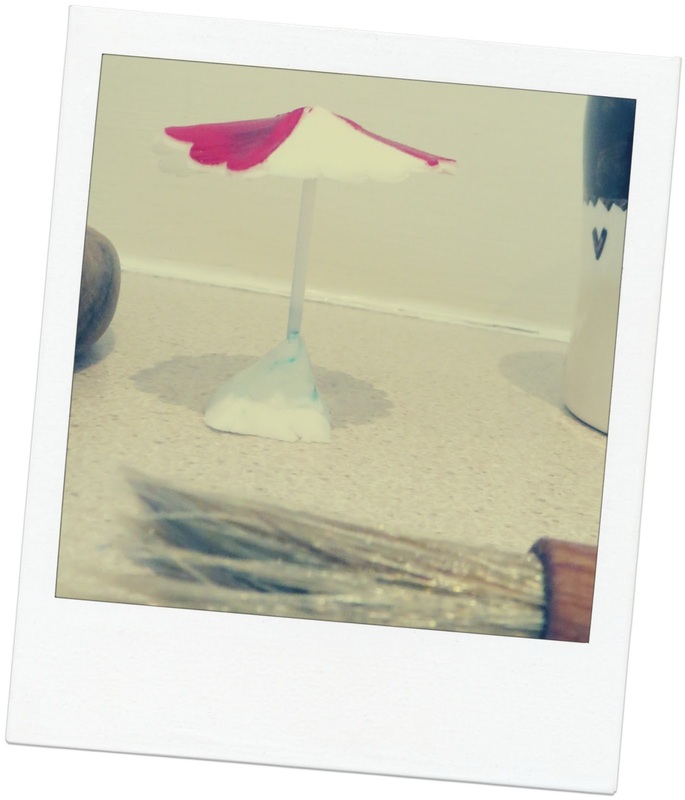 After it had set - which took two whole days in the fridge - I stuck the cocktail stick of a cotton bud to the parasol using a blob of icing and water, then made a base in the same way. TIP: if any decorations are flopping or sticking, put them in the fridge to harden. And if fondant is cracking, a little water brings it back to life. Then, the cake-baking. I used Nigella again, this time the Malteser cake from Feast: Food that Celebrates Life. 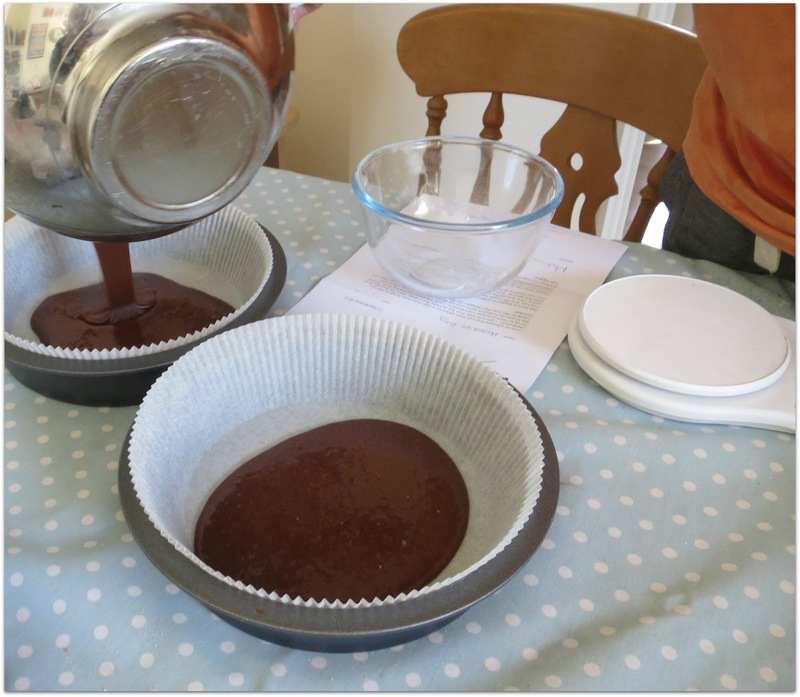 Oven on, at 170C, and line two circular cake tins- 20cm ones are ideal. Whisk together the sugars and eggs, then heat the milk, butter and Horlicks in a pan until melted, and hot, but not boiling. Pour into the egg mix, and add all the remaining ingredients. Divide the cake batter evenly between the two tins and bake for 25 minutes, until a skewer comes out clean and the cakes spring back when pressed gently. Let them cool, then turn them out of their tins. 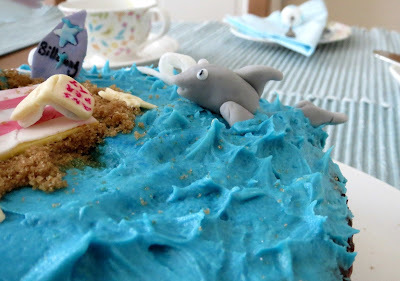 For the 'sea', I made a thick buttercream frosting, (with 50g soft butter, 125g icing sugar, 1 teaspoon milk) then tinted it blue with food colouring, and used a spatula to 'flip' waves upwards. The 'sand' is a sprinkling of Muscovado sugar. I had made a slab of yellow fondant, but this looked more realistic.